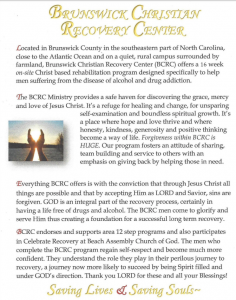 Brunswick Christian Recovery Center is a non-profit, faith-based ministry serving those suffering from active addiction. We are not a traditional short-term rehabilitation facility. We offer an extended program of directed activities that extends from remedial or supplemental education of the individual all the way to daily application of newly learned skills. This is a proven program of recovery that absolutely works for anyone willing to adopt it. The residents not only study the spiritual principles that foster sobriety, but with the help of a 12-step program begin to build a bright new future by working to erase the wreckage of their past.